Jeanologia, a leader in developing sustainable technologies for garment finishing, is set to premier two innovations in sustainable finishing for denim and activewear at Kingpins New York (July 21-22). Through Pure Eco, the Spanish company is unveiling new developments to create a range of denim finishes, including natural effects, 3D and vintage looks, to knit and denim using its low impact eFlow technology. The process uses just one glass of water for each garment. The Light Ripper laser machine is a precise way to distress jeans, allowing designers to achieve a myriad of different types of damages spanning heavily worn-in looks with breaks and over repairs to more creative damage patterns. The laser can be applied to rigid and power stretch fabrics. The Light Scraper machine is a new optical technology that allows the cloning of worn and scraped looks. The result is a garment with authentic virtual slubs on standard denim fabric. Pure Eco is part of Jeanologia’s initiative to increase the number of American designers applying technology to achieve new effects and finishing in their collections through sustainable and efficient processes. The message is, designers can adopt environmentally-friendly solutions in their design processes without compromising on the final look. Jeanologia is also introducing iKnits, a collection focused on athletic apparel. The innovation delivers performance features like moisture management to standard raw materials through eFlow technology. With a combination of laser technology, waterless Ozone G2 technology and eFlow, Jeanologia achieves different finishing on materials like cotton, neoprene and cupro, bringing new design possibilities to the performance apparel market. **This post first appeared on Rivet here. 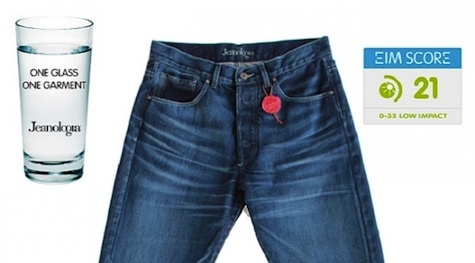 This entry was posted in Manufacturing and tagged Denim, Jeanologia, Rivet, technology.